The L.A Millinery Guild hosted its first fashion show, kicking off LA Fashion Week to an electrifying start. The theme of the show, the “Mad Hatter party” showcased the hats of designers Diego Hats, Hatstruck, Montez, Stage Door Daisy, Elizabeth Marcel, Suzi Holloway, Jill Pfeifer, Linda J. Key, and headliner Anita Hopkins. The show juxtaposed vintage allusions with futuristic design. During the nostalgic component of the show, Sarah Vaughn’s throaty voice evoked sirens of the past, sirens who donned hats in equal measure to Sunday morning service and Saturday night jazz clubs. The show served as a reminder that hats not only belonged to the whimsical world of Mad Tea Parties, but to the social history and fabric of American society crossing all cultural lines. Hats have played a key role throughout the past, from berets worn by women in Minoan Crete to the Petasos worn by Classical Greek ladies. Etruscan women wore snoods with curls hanging over their foreheads while the women of the Byzantine court donned pearl-encrusted headresses, akin to today’s headbands. Women living during the Italian Renaissance wore turbans while 13th century women donned the “Crespinne” a hairnette coupled with a fabric called the “barbette.” If a woman wore a crespine alone it was considered shocking. While the first half of the show conjured the past, the latter portion envisioned the future with designs by Anita Hopkins. who reinvented Lewis Carol’s theme as Alice in Spaceland. The dramatic theme song from the film “2001: Space Odyssey” heralded the entrance of her Fall 2010 Collection. Hopkins is a designer who successfully weds beauty and drama, with a wry sense of humor. It is no coincidence that the blockbuster comedy “Bruno” featured her ubiquitous yellow hat on its title character and worldwide posters. Her designs at the Millinery show likewise evoked the dramatic, the iconic, and the cinematic, including the runway’s hero, the Space Cowboy. 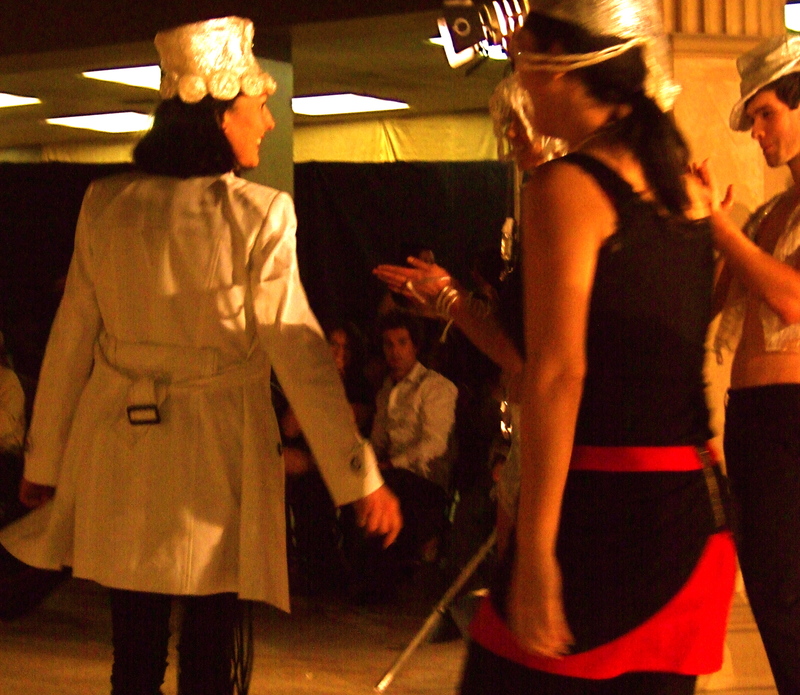 Due to the minimalistic costumes on the models, the hats came into the foreground, top hats that evoke an alluring Mad Hatter, a happily wedded couple, and an Andromeda, alluding both to the Greek princess and the spiral galaxy. Most strikingly, the material for all the hats and costumes was comprised of—plastic rap. 10,000 square feet of plastic wrap, to be precise. From a material most people would discard without a second thought, Ms. Hopkins created turbans, skirts, top hats, and vests. Even during a dour economy, artistry soars, showing that talent has no bounds. The inventive use of Plastic Wrap calls to mind a moving scene in the film American Beauty. The teenage Ricky Fitts videotapes an empty white bag dancing in the street. Watching the video tape, transfixed, absorbed in what others pass by, Fitts observes, “It helps me to remember.. there’s so much beauty in the world.